If you come over and take down my Christmas decorations, I’ll pay you in tortilla chips. I think it’s a fair bargain. All season I was like OH NO I’M TAKING DOWN MY CHRISTMAS STUFF IMMEDIATELY! and I’m so organized and the minute the holidays are over my tree is coming down and I’ll be all set for the new year and no tree is going to disturb my goals for the new year and.. and… and… no. Big no. The tree is still up. Any thoughts of taking it down are ruled out by extreme laziness on my part because I just don’t want to do the work. I want to do OTHER work. Just not that work. It’s that thing that you know will make everything better and the hour or two will be very well spent and make you feel extremely put together but you just don’t do it. In a way, it’s sort of like eating a bowl of cereal for dinner when you know it’s not gonna do any good. I mean, cereal for dinner might taste good, but I feel satisfied for approximately 34 seconds and then decide on some cheese and crackers and then a glass of wine may as well be included since it’s practically cheese and cracker mandatory and then you just end up with half your arm stuck down the cereal box again. Now that I’m comparing my Christmas tree to a cereal box and complaining about it all on a public forum to my invisible internet friends I’m going to shut up because sense I am not making. But I’ll still pay you in chips? Man. These chips. They might end up with monetary value. You should really take the deal. In a normal post, I’d maybe talk about the hummus. But this is not normal and I am anything far from normal. Well, actually I’m very normal. In the boring sense, you know. The hummus is delicious – I used a roasted jalapeño and lots of honey and the ice water trick from one of my favorite cookbooks. It’s super creamy and flavorful. But the chips are where it’s at. A few months ago I discovered this crushed jalapeño pepper and have fallen in love. It’s sort of just like crushed red pepper flakes… but maybe even hotter. Which is NUTS because spicy things are not at the top of my list. My taste buds are babies and can’t deal. When things are too spicy, they are no longer enjoyable for me because I can’t taste the flavor. I just chug eight gallons of water instead. So while these crushed peppers needs a light hand, I’m all over them. I brushed the tortillas in olive oil and sprinkled on a few other spices, baked them until crispy and went to town. When flour tortillas get crispy, all of their flakey layers get crispy and… gah. They are crunchy and flakey but also sort of melt in your mouth. We not only ate the chips with the hummus, but later that night we ate them with this soup (perfect!) and then I ate a few with some sliced smoked cheddar. I now have two choices. 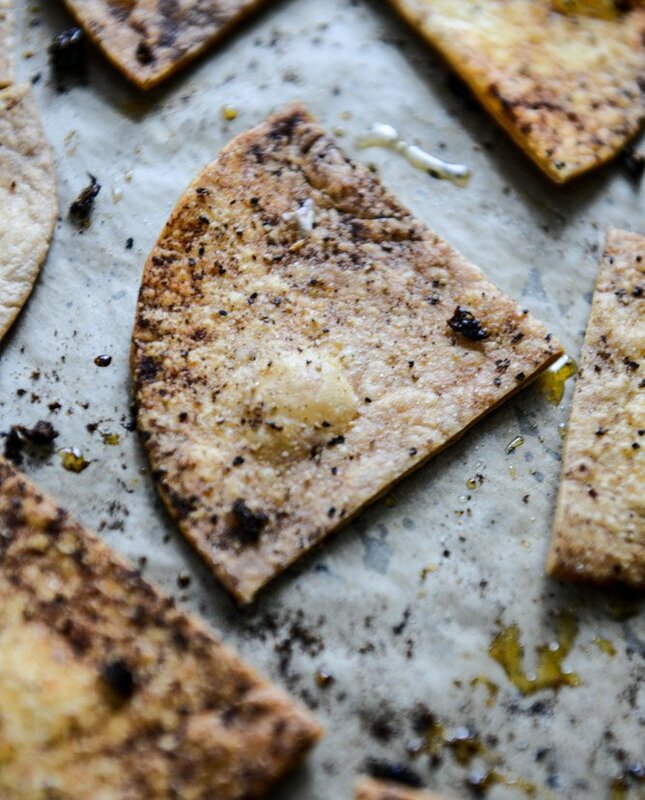 Never eat another snack again or make olive oil chips every single day of my life. Preheat the oven to 375 degrees F. Place the tortilla wedges on a nonstick baking sheet and brush them with the olive oil. In a small bowl, stir together the dried jalapeño, paprika, garlic powder, salt and pepper. Sprinkle it evenly over the tortillas. Bake the chips for 10 to 12 minutes, or until slightly golden and crispy. Note: I use this method to roast the jalapeño. Add the chickpeas to the the bowl of your food processor and blend until they are somewhat pureed. Add in the tahini, honey and jalapeño, and blend for another minute or two until combined, scraping down the sides if needed. Stream in the olive oil with the processor running and continue to blend until the hummus is smooth. Add the salt and pepper, blend a bit more, then taste and season additionally if desired. With the processor running, stream in the ice water and blend until smooth once more. Serve with the tortilla chips. Real Life Wednesday: On Vision Boards. Ummm…I might trade you tree un-trimming for chips. And my hatred of unpacking suitcases is intense, I still haven’t completely unpacked and put away my suitcase from Pittsburgh. It is not good. I have yet to make my own tortilla chips. I feel like it would be wrong to not start with these. I love anything with smoked paprika, and then throw in a little jalapeno? Uhmm..yes puhlease. Plus, I just want to faceplant into that Jalapeno Honey Hummus. Dying over these! Pinned! I love bubbly chips. Can’t wait to try them, I would take payment in the for of chips for sure.! 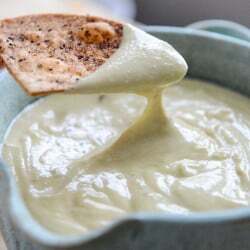 I make jalapeno hummus all of the time, but I have never put honey in it, that sounds amazing! Sweet and spicy!!! I love it!! I believe you just turned hummus on its head, my dear…and it’s never looked so delicious. Can’t wait to try this at home! Fav snack of all time! I’m thrilled to see how easy those chips are to make! Homemade hummus is a staple in my kitchen so I will definitely be making those chips soon! Normally our tree stay up to till like Feb. One year we actually but heart all over it for Valentines day. Yes, we did. This were are in the middle of moving so it actually came down a few days after Christmas. Totally depressing if you ask me. Love the humus + chips. I always forget about simple things like this, but they are just say good. I need to make more of them! 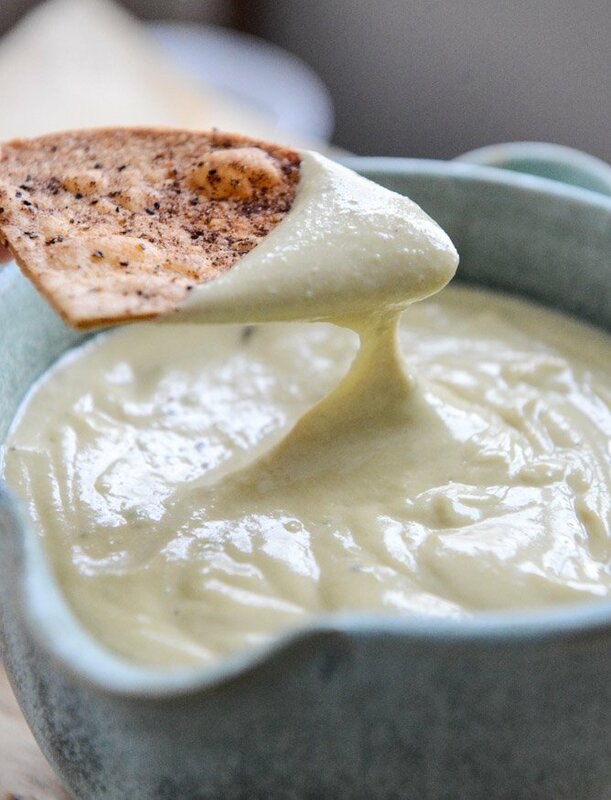 Oh my… That hummus looks so smooth, almost like melted cheese. You just gave me an idea how to something different to the chickpeas I have in water right now, just waiting for me to cook them. The chips and the hummus sound amazing but what I really want to know is how you got that hummus so smooth!! Looks delicious. i really think it’s the ice water! do you have the jeruselum cookbook? it’s so incredible. his hummus uses ice water and it’s usually this creamy too! No! Adding Jeruselum to my b-day wish list. I solved my problem of getting my Christmas decorations down this year — my son wanted to make some extra cash and he’s finally old enough to be able to help! That was $5 well spent ;) Those chips look amazing. I’m always intimidated by the idea of making humus but it’s really not too bad. I think I will have to try it again, this recipe looks too good to pass up! Even though it’s almost 9 am here I would totally eat that right now for breakfast. I love the idea of honey and jalapeno together. Yum Yum! that hummus looks SO creamy! like mayo. mayo hummus. i think that needs to be a thing. Yep, my Christmas tree is totally still up. I was going to take it down last night and then….my arm was in the tub of chocolate covered pretzels I “hid.” We have until Valentine’s Day before the tree looks totally disrespectful, right? give me ALL the tortilla chips. ALL OF THEM. the end. This looks absolutely tasty, and I’m not one for hummus. But I think this might make the table for Superbowl with some pita chips! Thanks for sharing! I mean, stop it with how ridiculously good this looks. I can’t WAIT to make this! That hummus looks so silky and delicious! I love making homemade tortilla chips, they’re even more addictive than store bought! This looks amazing! I really need to make my own tortilla chips, and these are going on my list of things to make asap. I love making chips with flour tortillas. It’s a great way to use leftovers tortillas after tacos. I’m usually not a big spice fan, but I’ll have to give this a try! Jerusalem is one of my favorites! Love this sweet and spicy take on hummus. Ayayay! Haven’t made my own chips in a while! This morning must be hummus Thursday or something. I’ve seen 5 recipes for hummus within the past 10 minutes! Rejoice!!! These look amazing! Hummus and chips are one of my favorite after work or happy hour snacks. Ohhhh…I love that dried jalapeño from Penzeys, too! I’d gladly take down your Christmas decorations for a bowl of this hummus! It’s so interesting that the common foods we always have around the house will make something new and exciting! I’m going to try this with hubby and a nice tasty beer. I took out my tree the other day while watching reruns of Being Human .I filled my front hallway with so many needles, it looked like a green shag carpet! My pellet stove dries the tree out so much and the fact that we had for at least 8 weeks! But now every time I vacuum, it smells like Christmas all over again. Oh joy! 8 weeks! i never knew a real tree could last so long. 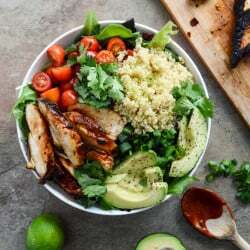 I could spend hours and hours on your blog, this looks so yummy! I am a hummus freak..like I would seriously bath in Tahini if it was socially acceptable.. but since it is not I will stick with the standard soap and water.. but a tahini bath would be way better. This hummus looks amazing – I love the idea of using honey. One trick I heard to creamier and fluffier hummus is to put the tahini in the food processor first on its own for about thirty seconds. It gets all whipped and fluffy, and then you add the chickpeas .I like the texture so much more that way – try it some time. definitely going to try this! thanks. What does it say about me if my day was made by you responding to one of my comments? Hello internet friend! I would absolutely inhale this! Love the hummus flavors and spiced tortilla chips. My husband and I live in a tiny apartment, so our tree is maybe three feet tall. But I definitely procrastinated taking it down. I’m going to be in trouble when we no longer live in a tiny apartment and get a bigger tree…because I will just never take it down. I’ve never even heard of adding honey to hummus before! Super interesting. And homemade chips are truly the best, especially with lots of heat. What can I say–I am definitely all over the spice! I feel like I could definitely be like you with the laziness of leaving suitcases and various things strewn about, but I live with the cat from hell who eats absolutely everything sooo I’m forced to put away things right away. In other news, I’m craving those chips right now. I could maybe live off of chips. No. Seriously. I’m a freakin chip officionado. There’s not many a chip that I’ve met that I haven’t liked! Ugh. Now I want chips. If these chips & hummus are on the line, I’ll be over in 5 minutes to get every single one of those decorations down and packed away! Ok I have that cookbook! How have I not made that hummus in there?? I want your hummus though! I love roasted peppers and that sounds heavenly. Honey in ALL THE THINGS please!! i am probably the only person in the world who doesn’t like roasted red pepper hummus! i love roasted reds, i love hummus, but together…so not a fan. i wish i liked it! Haha, I would totally come take down your Christmas decorations if it meant getting to eat that jalapeno honey hummus. It looks delicious! I plan to take my Christmas tree down this weekend (which is what I said last week), and this recipe might be just the inspiration I need to finally do it. Thanks for sharing! Luckily I have tortillas in the pantry and a Penzey’s on my way home… thank you. LOL I totally recognize myself in the selective laziness that comes up when you need to empty suitcases or dishwasher! It always feel different when you’re not doing it at home though, if I lived closer, I would definitely take down your Christmas tree for a bag of these chips and their dip ;) They look delicious! Love Penzey’s! I must get that Crushed Jalapeño spice! And this hummus look addictively delicious. Love this! Such a great idea! Thank you, Jessica. Love the chips…I could just make them and go totally nuts. HINT: Drinking water after spicy dish (especially with chilies) is NOT a good idea. Try some alcohol or milk or eat something fatty. It really helps – capsaicin is alcohol- and fat-soluble.